BALIF - Save the Date!!! BALIF Annual Dinner March 11, 2011! Save the Date!!! BALIF Annual Dinner March 11, 2011! 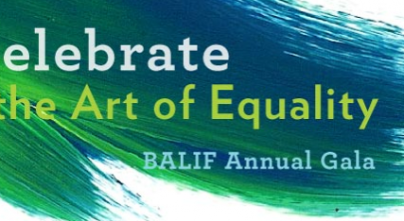 Please join BALIF at our annual Gala from 7:00-11:00 p.m. on Friday, March 11, 2011 at the San Francisco Museum of Modern Art. Celebrate the Art of Equality by honoring Legal Service Award recipient UC Hastings and Community Service Award recipient The Trevor Project. You can also sip a few cocktails, tour an art gallery, savor a dinner deconstructed, socialize with old friends, network with new friends, and dance to a few of your favorite tunes. Sponsorship opportunities and other details to follow!